Remember I told you I have a short attention span when it comes to gardening? Yeah, I haven’t done a lick of gardening in weeks. Fortunately, we are seeing signs of fall everywhere here in Minnesota, so it’s OK. I can start tossing the summer annuals and throw in some fall updates and call it good. First up, the front window box. As you may remember, I tried something new this year, a monochromatic look of all white and green. Here is how it looked when I planted it in May. And here is how it looked by the end of August. The Euphorbia ended up doing really well. In the end though, the white impatiens were the star of the show. Then, the impatiens all kacked. I find that not many of my fellow gardeners are aware of this, but there is a virus that has been sweeping the nation and it attacks impatiens. One moment they are full of blooms and looking gorgeous, and a mere week later they are nearly dead. The flowers fall off first, then the leaves and you are left with nubbins of stems. You will be tempted to believe that some kind of creature came and ate them, but no, it is a disease. I hadn’t been planting impatiens for the last several years because of this, but last spring someone told me the virus had been ‘cured’. This was bad info. In reality, they have not found a cure. According to my super scientific google research, the virus remains in your soil and will infect any impatiens you plant in that spot next year. It also is airborne, infecting neighboring plants. The double whammy of plant viruses, I guess. Well, live and learn. Next year, no more impatiens and I don’t think I’ll do the same monochromatic look. It looked great close up, but from the street it lacked punch and without the impatiens, it just didn’t have much impact. So, I yanked all of the remaining stems (bagging, sealing and tossing as recommended) and replaced them with white mums and some white pumpkins in keeping with my monochromatic look. 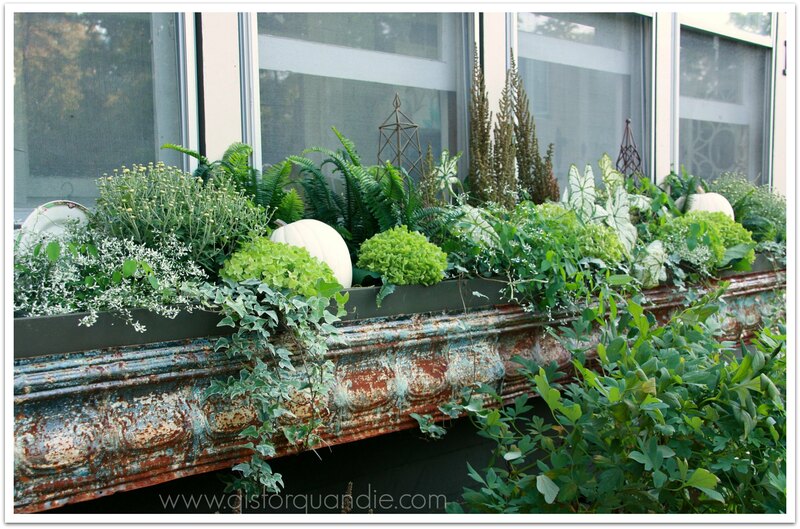 And here is how the window box looks for fall. The ferns, ivy and caladium are still going strong, so they stayed. I added two white mums (flowers not quite open yet, and they better be white like the label says! ), two white pumpkins, and some cut flowers from my Annabelle hydrangea. My Annabelle’s turn a lovely chartreuse in the fall, do yours? It’s an interesting twist on fall, not the traditional fall colors of yellows and oranges, but I love it. I found the mums, kale and white pumpkins at Menards this week. The mums were $3.98 each, the kale was $3.99, and the white pumpkins were $4.59 each. 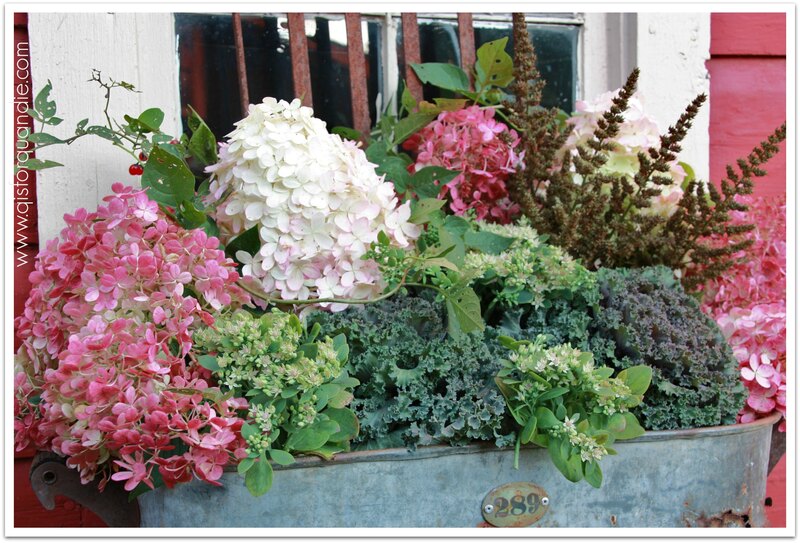 So for about $33, and with the help of my prolific hydrangea bushes, I was able to give a both my large window box, and my two galvanized boiler pot planters a pop of new life for fall. Hey, wait a minute, I don’t think I’ve ever shown you these. Ken built them for me. Both of the boiler pots came from garage sales and were super cheap because the bottoms were rusted out. Ken added some wood slats, and then mounted them for me. One on the Carriage House and one on the Photo Cottage. I used the kale in this planter and added some Strawberry Vanilla hydrangea blooms, some Sedum flower heads, and some dried Astilbe flower heads. Here is a better look at the arrangement. 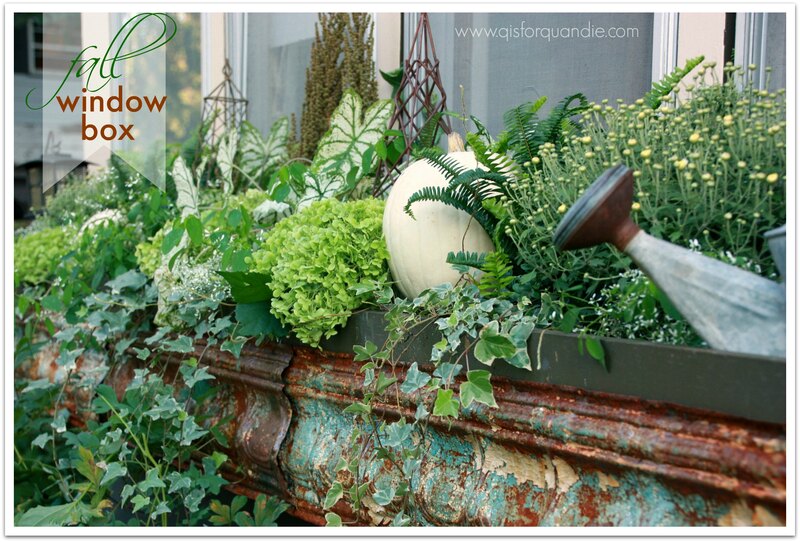 I really enjoy being able to use stuff from my gardens in my window boxes for both fall and winter. I’m hoping that these arrangements continue to look good for the next two months or so. Or at least until the Carriage House sale. Then sometime in early to mid-November I will switch them up again for winter. I’ll be sure to share them with you again then! Previous turning a foot board into a chalkboard. 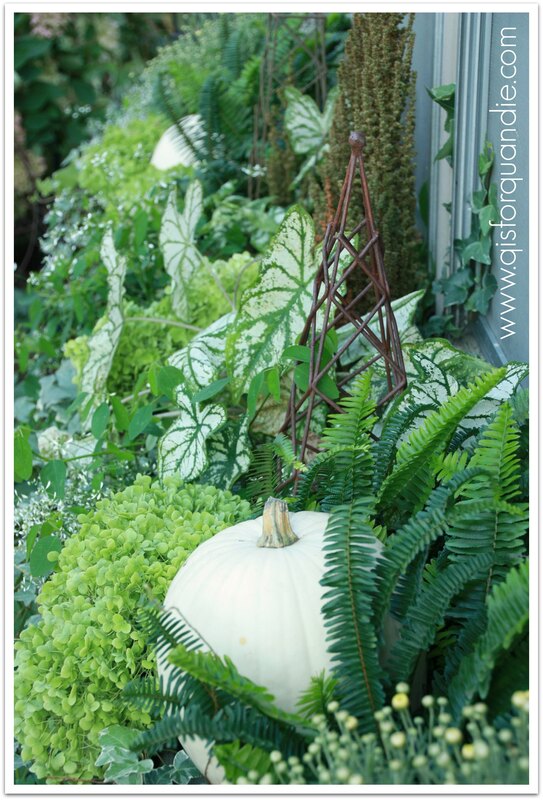 It never ceases to amaze me that you know the names of all the greenery…all I know is that it looks great…especially the white pumpkins. Good choice. I have to admit, even I don’t know why those names stick in my head yet I can’t remember all the names of our new employees. Go figure. 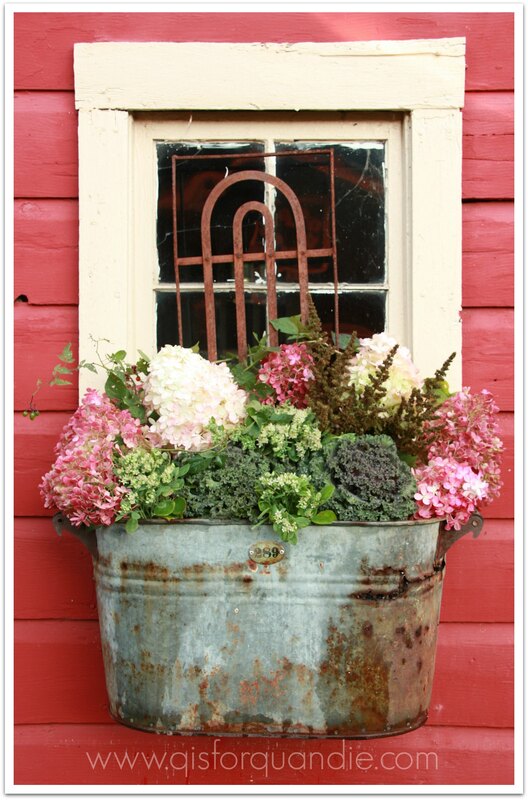 I adore the arrangements in the old boiler pots-so pretty! Very nice. I like the white pumpkins too. Yep, that’s what I’ve got. From what I’ve read there isn’t anything you can do about it, except quit planting impatiens. Lovely lovely. 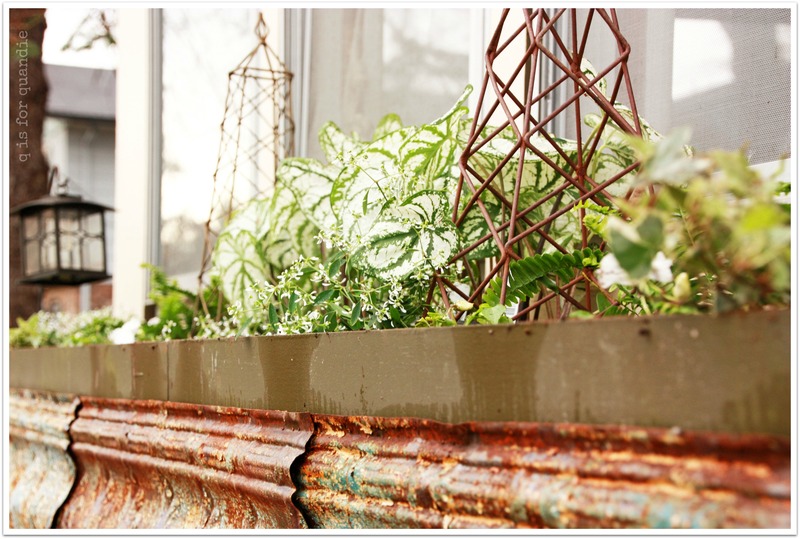 Window boxes are on my list. Hmmm….I had not heard about that virus mine have not been affected or infected either. 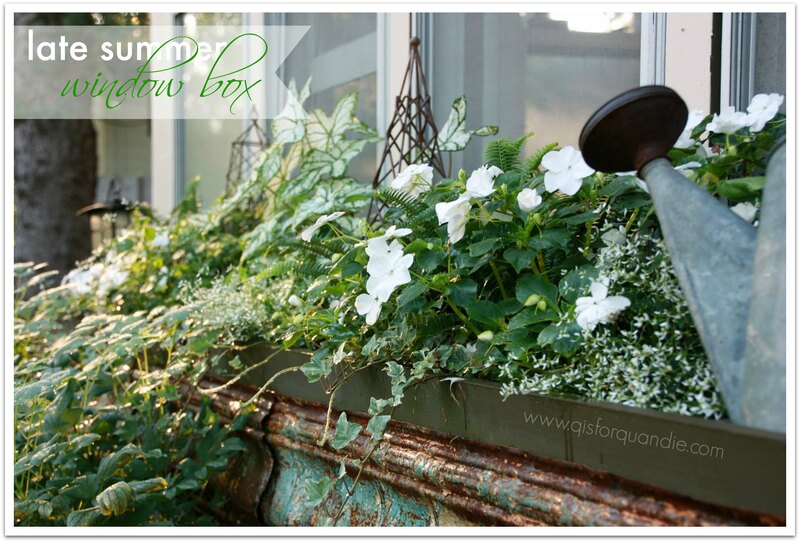 There is something about a window box, maybe it’s just that it brings the flowers up closer to eye level … or maybe it’s because we can then see them from in the house. Whatever it is, I love them.